Since I started working at the cafe at the beginning of 2015, blogging took a backseat. I missed writing dearly but fatigue kept me away from doing many things I love. I could barely stay awake between work duties and my athletic endeavours. I rarely cooked any meals for myself and survived on ready-to-eat things like yogurt, cheese, raw vegetable, and fruit. I felt malnourished both physically and mentally. My foray into the day-to-day operation of a coffee shop wrapped up last week. I learned a lot in the past 10 months and now it is time to regroup. I have some thinking to do to figure out where to go from here. I also have a lot of free time to attend some long-overdue chores and do things that I love. For the first time in my adult life, I am almost entirely free of commitments. This sense of freedom is both liberating and scary at the same time. Top of my priority is to take good care of myself with nourishing meals. As much as I hate to admit it, I neglected my health while burning the candle at both ends. I crave nutritious home cooked meals: simple food with vibrant flavours from fresh ingredients. 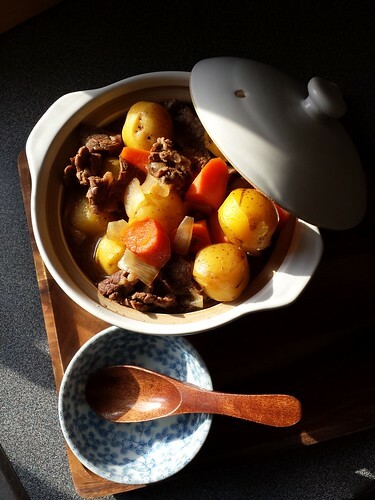 My mind immediately turn to comfort food like nikujaga, Japanese-style beef and potato stew. I love the uncluttered flavours of this homey stew. Beef short ribs, potatoes, carrots, and onions braised in a dashi broth flavoured with soy sauce, sake, and mirin. 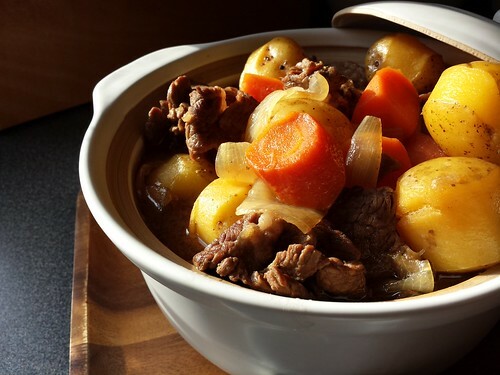 Like most stews, it tastes even better the next day after the flavours have a chance to develop. I cut boneless beef short ribs into thick slices so they would not turn leathery during braising. I used baby potatoes and peeled a ring of skin away. Of course they looked adorable but that was not the reason. The exposed flesh absorbed the meaty broth much better so they tasted amazing. I roughly followed the direction from No Recipes. The seasoning was spot on with a good mix of savoury and sweet. 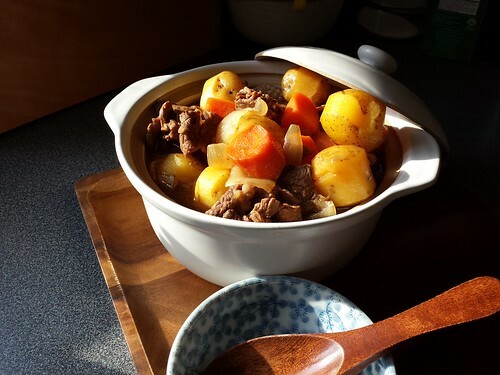 I enjoyed my nikujaga with rice but it could just as easily be a one-pot meal thanks to all the potatoes. As I worked in the comfort of my own kitchen, I was reminded of why I fell in love with cooking. The house was quiet except for the occasional noise of my knife on the chopping board or steam bouncing out of a tightly covered pot. The late afternoon sun casted a golden glow to everything in the kitchen. I was in no hurry. It was simply the quiet enjoyment of immersing myself in the aroma, taste, sound, and sight of cooking. It’s been far too long since I felt so calm. I still don’t know what I’m going to do with my life but that’s okay. A break is sometimes necessary before I forge ahead to new adventures.